Stephen King, in Danse Macabre, lists Shirley Jackson’s 1959 The Haunting of Hill House as one of two “great supernatural novels” of the last century. (The other is The Turn of the Screw.) In it, a disparate team investigates a haunted house, only to find exactly what they sought: fearful hauntings written so deftly they often leave the specifics up to readers’ sprinting imaginations. King loves it. He spends dozens of pages assessing its blend of atmospheric supernaturalism and intense characterization. He also attempts to assess why “so many so-called horror movies” simply don’t work. Of course, this has never stopped him (or anyone else) from adapting their favorites. In the case of literary horror, the miniseries has often seemed more effective than film—and, in the latest version of Hill House, it may have finally found its successor. King’s own Jackson-adjacent miniseries, Rose Red (2002), was going to be a farewell. It came right after King was struck by the car while walking in Maine—in fact, it was the first fictional project he worked on after his recovery—and he planned it to be one of his last, at least for public consumption. Steven Spielberg and King shared a love of the novel’s first film adaptation, The Haunting (1963), and that’s where things get tricky. Spielberg went on to executive produce the film’s 1999 remake, while King wrote Rose Red’s Jackson-based teleplay. They’re adaptations of an adaptation, with Rose Red three media removed in this game of IP telephone. That meant they got further and further from Jackson’s vision, feeling stuffed, campy, and rote rather than faithful. One of the shepherds of the recent resurgence of King screen adaptations, Mike Flanagan (Gerald’s Game, Doctor Sleep), has now tried his hand at a similar adaptation— inspired by Jackson’s book, but with its influence stretched over 10 episodes, and departing from the novel’s plot. It’s good, maybe as good as the 1963 film, though that version, directed by Robert Wise, approached the source material with far more fidelity. But sometimes, fidelity is overrated. 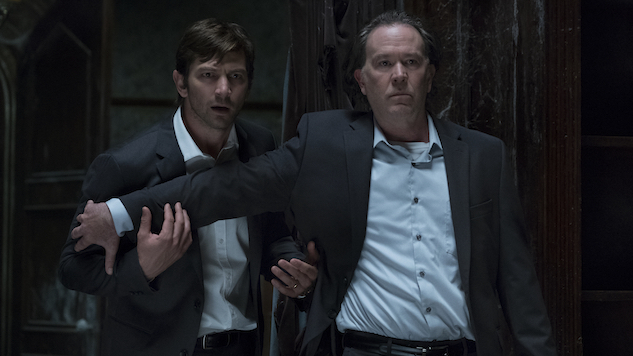 In the show, which debuts Friday on Netflix, many character names remain the same—Theodora, Luke, and Hugh Crain, along with Mr. and Mrs. Dudley—though Flanagan and co. exorcise the specter of Jackson immediately with a dash of intertextuality: In this story, Steven Crain (Michiel Huisman) wrote The Haunting of Hill House, the first of a series. Adaptation becomes key to the story, only it’s scarier now that the tale comes from the hero’s real-life experiences. Crain is introduced while researching a different haunting, one with an uncertain psychological and/or otherworldly source. This theme develops further as we learn about the other characters’ childhoods in the haunted house and how it came to affect them as adults, building out a family’s complete experience through different perspectives. We get the original view in flashbacks from the kids, memories that are then subject to change—adaptation—by their particular coping mechanisms, denial, or acceptance. It establishes Flanagan and co-showrunner Meredith Averill’s approach to the novel: gaining a deeper understanding of a paranormal experience through multiple, distinct viewpoints. But it doesn’t start that way. The Haunting of Hill House opens and closes with a barely-changed reading of the book’s opening paragraph, which colors the introduction with Jackson’s subtle power—though when you throw a few dashes of paint on a Goya, the eye lingers on the change. From then on, the script is literary only in design. Multiple monologues build like passages in a book: slow at first, with a just-off hook (Wait, what? ), then accelerating towards something awful (No, no, no), and finally exploding in a burst that seems to last forever (Oh, God!). The series’ writing mimics that of a novel, just as the filmmaking mimics the terror—not horror—of Jackson’s descriptions. It’s drenched in dread, drawn out thanks to the deliberate pacing of each episode and the steady march of the series as a whole. King, in the Rose Red making-of documentary, embraced the miniseries as the closest filmed form to a novel. What’s even better about Netflix is that you get all the elements of a miniseries without commercials, all at once. Its bingeability puts the onus on the viewer as a novel does the reader, mimicking the experience of reading before bed and finding yourself glued to the story by perverse interest and fear well into the morning hours. You can pick it up and put it down at will. Hell, you can even flip to the back and find out the ending. It is, as The Haunting of Hill House proves, a worthy successor to the theatrical film and the linear miniseries as the novel’s preferred adaptive medium. That said, it’s hard to maintain the spirit of a subtle book filled with suggestion when the core concept of your medium is “show, don’t tell.” Implication is replaced with reality, especially if you’re excited to show off your animatronic ghouls ($150,000 each in Rose Red’s budget). Imagination is undercut by prowess; the technology is there, the money is there, and subtlety is for low budgets. Overcoming that impulse is key for getting the vibe right—and in adaptation, the vibe is everything. Nailing Jackson’s kind of fright is paramount. A movie can, in theory, be the stringing together of interludes between jump scares. A TV series? Not so much. So Flanagan and Averill give us more, applying the structural elements of TV to enhance components of the book. The shifting labyrinth of the opening credits reflects Rose Red’s constantly renovating mansion and Jackson’s surreal architecture before we even get a grasp on the house itself. The show’s seesaw timeline elegantly translates the novel’s Eleanor and her sensitivity into an entire family. These siblings personify plotted points on a graph, tracking the intersection of psychology and parapsychology that’s long haunted Jackson’s tale. Their arcs, their histories, are given ample time to bloom and wilt as the house attacks, takes hold, and leaves lasting marks on all of them. It’s here that the aesthetic of The Haunting of Hill House makes it work not only as horror TV, but also as a deft adaptation of Jackson. The monsters, ghosts, and things that go bump on the wall are off-screen, barely shown, or obscured by shadow. The series even goes back to some of the first film adaptation’s decisions, in terms of camera movement and shot design, in order to develop uneasiness and inconsistency. Well, maybe “inconsistency” is the wrong word. The only thing that feels truly inconsistent while watching it is your mind: You’re constantly wary of being tricked, but the construction of its scenes often gets you anyway. Shots lead your eye then punish your concentration with a quick cut, for instance. In its cinematographic fun house, adults become kid-sized as they navigate the home and kids, though tiny, dominate the frame. Timothy Hutton merely has to exhale to disappear entirely. The actor, playing the family’s patriarch, sighs in his sleep in an early sequence, which, thanks to the framing of the shot, makes the actor seem about half his size. The moment may lead to a jump scare, but the exhalation becomes the scariest part of the sequence. He deflates so much, without seeming to curl or hide, that it looks like the life has been sucked from his lungs. When an unnatural arm comes around his side to spoon him, we realize it’s an assailant rather than a partner simply because of this expression of vulnerability. But it’s not just Hutton. People are swallowed up by the homes, by the emptiness, by the ominous possibility of the negative space. A beautiful zoom at the end of the second episode uses deep focus and a model home to express utter insecurity about the show’s fortresses of elongated halls, hidden rooms, and rattling doorknobs. By embracing the squirm—and the time necessary to get us to squirm rather than jump—it’s clear that The Haunting of Hill House is great at creating troubling scenarios, but even better about letting us simmer in them. A horror movie’s runtime implies relief. A TV series, especially one unwilling to ply the viewer with cheap scares, a quick tempo, or easy resolutions, can feel as endless as a book’s hefty back half, looking at you from the other side of the bookmark. When The Haunting of Hill House ends, it’s a journey more like King’s The Outsider than anything in the James Wan oeuvre. That confidence in storytelling, adaptive in some ways but truly new in others, makes for satisfying long-term trips into a genre recently shoehorned into two categories, Blumhouse or arthouse. As Netflix finds itself willing to adapt to the aesthetics of its creators rather than vice-versa, its unique formal offerings make it an increasingly attractive home for longer adaptations of thoughtful stories. The Haunting of Hill House premieres Friday, Oct. 12 on Netflix.